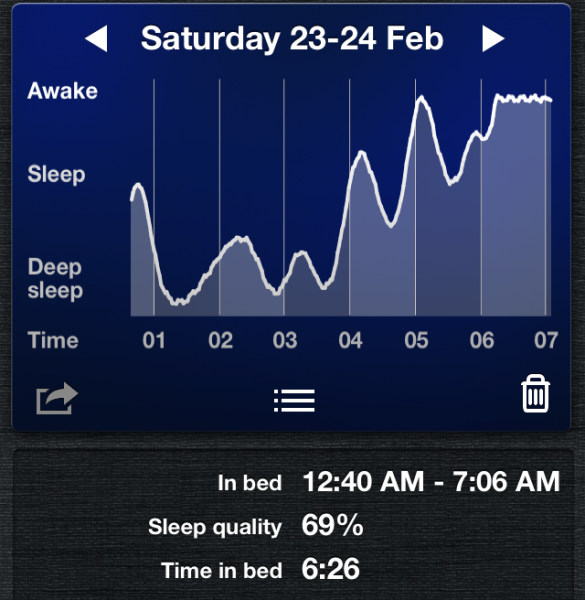 I've learned a lot from that app I purchased, Sleep Cycle. Since I've started using it, I've learned several specific things, more than just the vague, "I haven't been sleeping well." Thursdays, oddly enough, are my worst nights for sleeping, and Fridays are the best. I have difficulty entering the deep sleep cycle in the second half of the night. Frequently I will wake up at 3:00 or 4:00 a.m. (unfortunately, this is often triggered by Rob coming to bed at that time). And then I have difficulty going back into the deep stages after that. 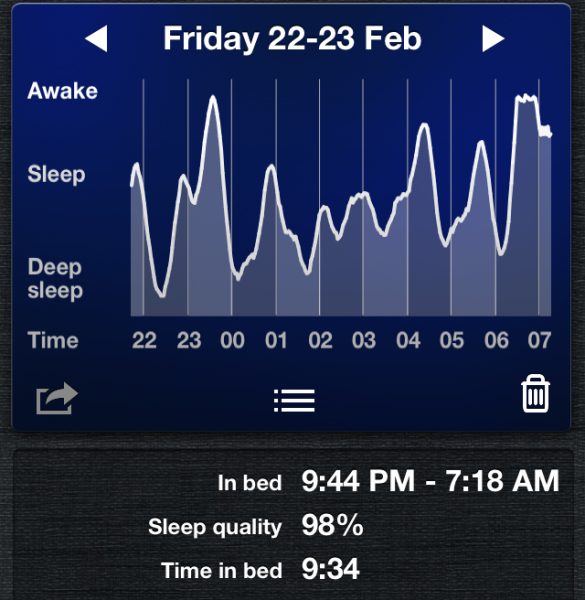 You can chart notes and see what affects your sleep. After keeping track of how using Melatonin affected my sleep cycle, which was something that had been recommended to me, I discovered it wasn't doing a thing except perhaps making things worse, so I discontinued it. I sleep an average of seven and a half hours a night. Frequently, I alternate a bad night with a good night. I had a particularly dramatic example this week, when my worst night (chart below), with only a 50% sleep effectiveness rate, was followed with one of my best nights, with a 98% effectiveness rate. This was my worst night. I never even reached the REM state except briefly right before 6:00 a.m. This is a good example of what seems to be some of my typical problems: I manage the deep sleep state in the first half of the night, wake up, and then don't sleep as deeply the second half. During the last hour, I was semi-awake, dozing before my alarm went off. 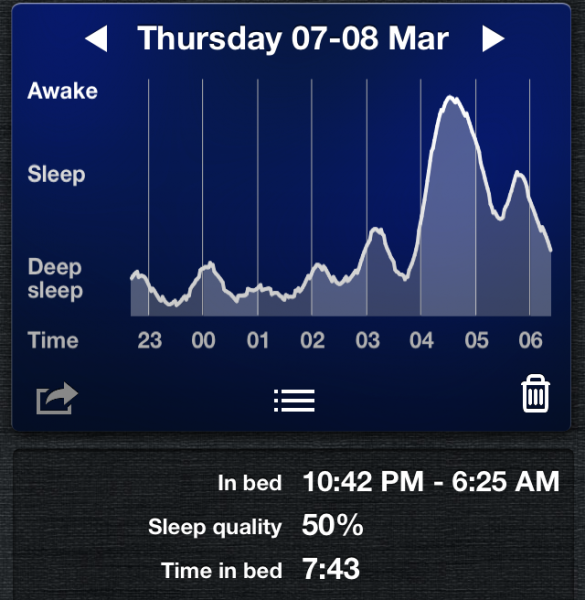 Anyway, if you'd like to learn more about your sleep, I do recommend Sleep Cycle. Come see Delia in Midsummer Night's Dream! Delia is going to be appearing her school's production of Midsummer Night's Dream. She is playing Helena. The performances are next Friday and Saturday at 7:00 p.m. and Sunday at 2:00 p.m. Anyone interested? Send me a private message on my livejournal or dreamwidth accounts, and I'll give you the details. I've just picked up the new album by one of my favorite musicians, Sora. I loved her last album, Heartwood, and her new album, Scorpion Moon is also beautiful. She has a gorgeous voice, and she loves to sing about subjects that deeply interest me. She writes a lot of songs about fairy tales. The new album has songs about Scheherazade, a mermaid, heroes, Rapunzel, and ghosts. Approximately 8% of adults will experience clinical depression in their lifetime, a debilitating and isolating reality. Those statistics tell me that everyone has known someone with clinical depression, someone reading this right now has been mired in the depths of that dark spiral. Once I was asked "do you understand?" when confronted with the terrible reality of another's misery. I wasn't sure how to answer, not wanting to discount or take away from the pain I was being presented with. This song was my answer. I would SO go on this tour. Fiona is applying to study at the University of Lancaster in England! She would be there next autumn. She will, of course, also take some time to do the obligatory running around Europe with a backpack. Among other things, she hopes to get to Florence to visit Mom and Dad's great friend Richard Serrin. I am so pleased she is going to be doing this. She has been working very hard to get all her ducks in a row, which has made the last several weeks quite stressful. Her passport was renewed this week. She hasn't quite decided which courses to sign up for, but one will be differential equations (Fiona's a math major) and one will be a literature course, including some study of Jane Austen. I studied at Cambridge University in England when I was in college, so I am feeling a lot of nostalgia. I told her how much I enjoyed my walking tour of the Lake District. Any of my readers in the UK in that area? Posting this for Fiona, my woman warrior and dedicated gamer. After launching a Kickstarter campaign to fund a long-term project that would examine the roles women play—or are consigned to—in video games, Feminist Frequency video blogger Anita Sarkeesian was subject to a vicious, violence-saturated campaign of harassment. While it was awful to watch Sarkeesian be threatened and slandered for the sin of wanting to do her job well and comprehensively, the utter inability of her harassers to shut her work down has been wonderful to watch.